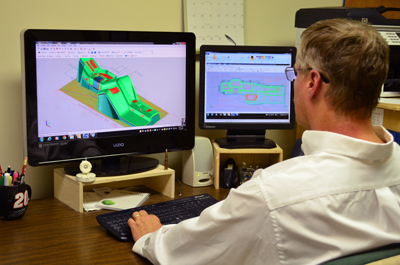 Medallion's design and engineering team is comprised of some of the most talented and experienced individuals in the thermoforming industry. Our in-house experts turn customer concepts into finished products through a variety of methods. This transformation process can be accomplished starting with a hand sketch, customer print, electronic file, or through the use of sophisticated design software. 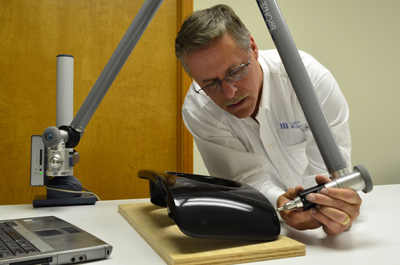 Regardless of the product development method used, our customers remain an integral part of the product creation process. This early and ongoing process partnership assures that the end product fulfills expectations for appearance, performance and quality. We can use your CAD models or design from scratch. A FARO arm is used to digitize a part into a file in 3D space. © 2018 Medallion Plastics Inc.